I know the problem. You’ve just woken up, and you’ve been stricken with a craving. Wherever it came from, all you know is you want something sweet and gooey, something bready and spicy. You want that mouth-watering smell to wake everyone up with high expectations. Yes, you want cinnamon rolls. With all speed. You don’t want cinnamon rolls three hours from now, and you’re certainly in no frame of mind to deal with anything complicated, since even the coffee is taking too long to make. Fortunately, there’s a simple, if slightly ersatz, shortcut. They’re called sticky biscuits, and they’re a glorious half-way point between biscuits and cinnamon rolls. Made with a biscuit dough, there’s no waiting for a traditional yeasted cinnamon roll dough to rise, but you still get the warm spice and sweet spiral filling of a cinnamon roll. I know what you’re thinking here: biscuits are hard! Didn’t I say these were easy? Oh, my, yes. See, the biscuit dough used here has no butter. Not one bit. No shortening, either. That’s right, there’s no solid fat to cut in or mess with at all, totally doing away with the most difficult part of making biscuits. So how does it work? The magic ingredient is heavy cream, and it provides all the necessary fat and liquid in one shot. With only four ingredients, these biscuits could hardly be simpler. Of course, without pockets of butter in the dough, they aren’t going to be terribly flaky. But they do turn out rather fluffy, especially considering how easy they are. And when rolled around a filling of brown sugar, butter, and cinnamon, they’re simply delightful. This filling, when baked, melts and runs out of the bottoms of the biscuits. But rather than being a tragedy, this is exactly what you want. After baking, the biscuits are inverted onto a plate, allowing the molten filling to turn into a gooey, sticky topping which (to me) eliminates the need for any glaze or icing, as you might drizzle over a pan of cinnamon rolls. Despite the sugary topping/filling, sticky biscuits are much less sweet than typical cinnamon rolls, because of the lack of icing, and because there is no sugar added to the dough. If you like, you can certainly add some, but I for one prefer less of a sugar rush, especially early in the day. One of my guests even remarked that sticky biscuits are better than cinnamon rolls, for this very reason. 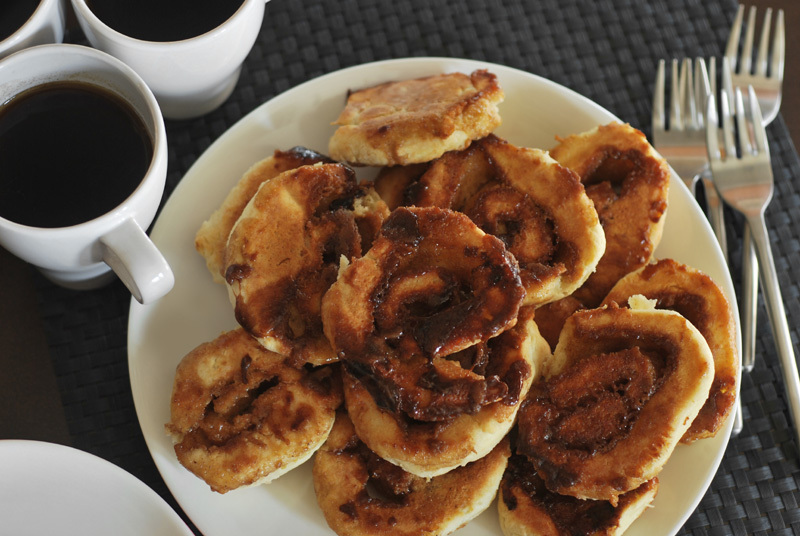 The end result is perhaps not quite as pretty as the standard cinnamon roll, but you can enjoy an entire batch of these long before any cinnamon roll is even halfway made. And when you’re still half-asleep, bleary-eyed and stumbling around the kitchen, speed matters far more than presentation ever will. Save the cinnamon rolls for Christmas morning. 1. Preheat oven to 450° F. Lightly oil a rimmed baking sheet, or line with parchment paper. In a bowl, stir all filling ingredients together. Set aside. 2. In a large bowl, whisk together the flour, baking powder, and salt. Add the chilled cream, and stir until the dry ingredients are just moistened, and a rough dough forms. 3. Turn the dough out onto a floured work surface. Fold the dough over itself once or twice, or until smooth and even. Using a rolling pin, and dusting with flour as needed to prevent sticking, gently roll the dough out to a long rectangle, about 10 by 15 inches in size, or between 1/4 and 1/2 inch thick. Gently spread the filling evenly over the dough. 4. Starting with one long side, tightly roll the dough up, jelly-roll style. You may need a bench scraper to help with this step. Cut the roll horizontally into 1 inch pieces. Place each piece, cut side up, on the prepared baking sheet. 5. Bake the biscuits at 450° F for 10 to 12 minutes, or until golden brown. Immediately transfer the biscuits to a plate, turning them upside down, and drizzling with any extra filling that may be left on the pan. Let cool for about 5 minutes before serving. 1. These can alternatively be baked in a nonstick cake pan. Place the cut biscuits in the pan so they touch each other. Bake as directed, and invert the entire pan at once onto a plate when done. 2. Be careful not to overbake the biscuits, as the filling will overcook quickly, turning into a hard caramel, rather than a sticky topping.